LIVINGSTONE, Zambia, June 2, 2014 (ENS) – Two men have been arrested in connection with the killing of Dexter Chilunda, the head of law enforcement at Liuwa Plain National Park. Chilunda was shot dead by suspected poachers while investigating gunshots heard by rangers in the park on May 23. The suspects were apprehended in the town of Lukulu, 35 kilometers from the park on Sunday. They are to appear in court at a date that has not yet been established. The arrests resulted from the combined efforts of the Zambian police, the Zambia Wildlife Authority and five Liuwa Plain law enforcement officers following leads by supportive local communities who were devastated by Chilunda’s death. 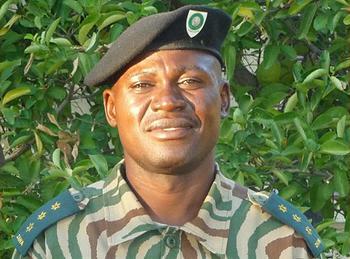 A ranger and law enforcement officer with more than 20 years’ experience, Chilunda was in charge of law enforcement at Liuwa Plain National Park. He was on secondment to the remote park from the Zambia Wildlife Authority, or ZAWA, when he was shot. Chilunda was buried on May 26 in Kaomo, 250 kilometers from Liuwa. He leaves a wife and seven children who will be financially provided for by a life insurance policy put in place by the nonprofit organization African Parks. African Parks takes on total responsibility for the rehabilitation and long-term management of national parks in partnership with governments, wildlife organizations and local communities. “The combined efforts of the Zambian police, ZAWA and the Liuwa Plain law enforcement unit that resulted in the arrests are to be commended, said African Parks CEO, Peter Fearnhead. Since 2003, Liuwa Plain National Park has been governed by African Parks Zambia, a partnership between African Parks, the Zambia Wildlife Authority and the Barotse Royal Establishment, the traditional government of the Lozi people. African Parks operates seven national parks in six countries: Chad, Rwanda,the Democratic Republic of Congo, the Republic of Congo, Zambia and Malawi.